Know a better way of doing something? Designed a clever jig? 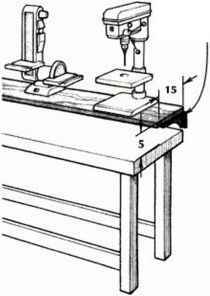 Send your original woodworking tips, along with a sketch or a snapshot to: *Tech Tips," American Woodworker, 33 E. Minor St., Emmaus, PA 18098. We'll pay $50 for each tip we publish and $200 for the best tip of the issue. This jig can be made in a few minutes and greatly simplifies drilling pockct holes in aprons, etc. Drill a hole down through the middle of a piece of scrap. Saw the block apart at an angle, then glue the two pieces together as shown. 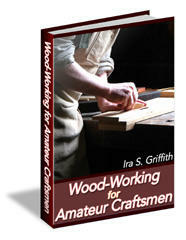 Now clamp the guide to the apron and drill the pocket hole. to make and adjust, and will always produce a fair curve. The sharper the radius of curvature, the thinner the batten should be. You need only glue the dowels into the batten because friction prevents any slippage in the 3^-in. board. I recently discovered that my variable-speed router makes a very effective spindle sandcr. The router is mounted in a table so I can raise or lower it to get the full use of the sanding drum. I buy l-in.-dia. sanding drums, 3 in. long with a Vij-in. shank for about $10. Smaller sizes are also available. 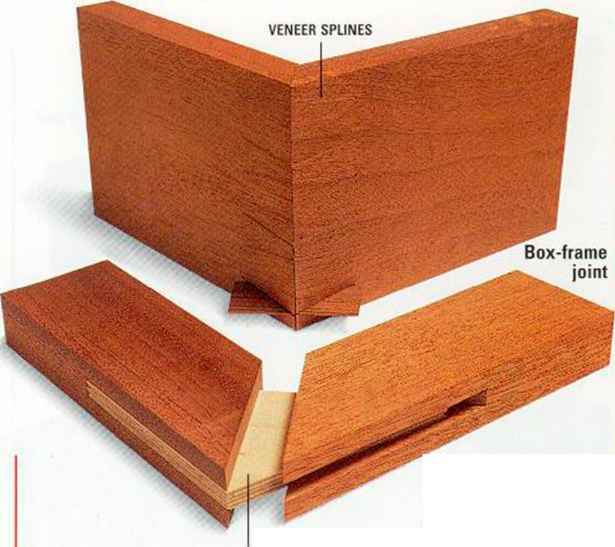 I used to store my veneers in a drawer or on a shelf but find hanging them more convenient, with less chance of damage and warping. Also, I can easily see exactly what veneers I have in stock. 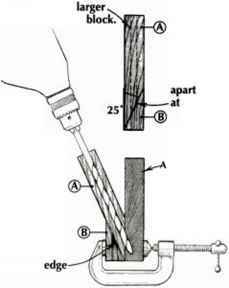 PRON Clamp guide to apron and drill pocket. Clue sawn surface of B to long of A. Support shelf with heavy-duti metal brackets. the bench and back again. The bench space under the shelf remains fully usable and is less likely to become cluttered.